I recently came across a national campaign started by Johns Hopkins called Meatless Mondays. Meatless Mondays is a campaign to get people to go meat-free one day per week, preferably Mondays obviously. Every Monday places would offer a meat-less entrée to go along with the other options. Now this doesn’t seem so bad, as many people are vegetarian or simply choose to eat less meat. I generally do not have a problem with that, as what you choose to eat is totally up to you. However, I do have a problem with the flyer that is offered to customers about the benefits of Meatless Mondays, which in my opinion is full of vegan/vegetarian propaganda, not facts. This flyer claims there are many health benefits to going meatless: limit cancer risk, reduce heart disease, fight diabetes, curb obesity, live longer and improve your diet. Wow, these sound fantastic, but are they true? To support their cancer risk claim they state that diets high in fruits and vegetables may reduce cancer risk (which is completely true) and that both red and processed meat are associated with colon cancer. This is incredibly misleading. In reality these “associations” are poor, and in most cases when studies claim that red meat was associated with colon cancer, it is because the study did not separate out processed from unprocessed meat. So things like hot dogs, sausage, and other processed junk are being lumped in with a steak. This is a large confounder. Not to mention these studies definitely do not separate out conventionally-raised beef (raised on horrible diets, unsanitary conditions, loaded up with hormones and antibiotics, etc) from pasture-raised grass-fed beef. There is another tremendous difference. Find me a controlled dietary study where even conventional red meat causes colon cancer, let alone pasture-raised. Good luck with that. To reduce heart disease, they recommend replacing full fat dairy and meat with vegetable oil. AHHH! Well since the association between red meat and heart disease was only ever there because researchers again did not bother to separate processed from unprocessed this is more junk advice. When researchers finally did separate the two, what did they find? No connection between unprocessed red meat and heart disease. What a surprise. And don’t even get me started on full fat dairy and heart disease, as that is even worse advice. A significant amount of research has found a decrease in heart disease risk from consuming full fat dairy! Please explain to me how red meat consumption increases diabetes risk? To justify claiming that eating less meat can curb obesity, they state that people on low-meat or vegetarian diets have lower body weights. This is because in general vegetarians tend to be people whose goal is to lose weight and be thin. Whether or not I eat meat has little to no bearing on my body fatness, my total intake vs my expenditure is the determinant of that. My favorite one is that Meatless Mondays will improve your diet. They claim that consuming beans and peas will provide higher intakes of protein, zinc and iron. What?!? Seriously, where was the fact checking on that one? Really, beans and peas provide more protein, zinc and iron than meat? This propaganda flyer goes on and on, and the worst part is there are not any references to back up their many ridiculous claims. Apparently you just have to take their word for it, even though there has never been a single documented culture thriving on a vegetarian diet. Ever. Again, if you choose to be vegetarian or have Meatless Mondays, that is just fine. It is not the philosophy I have an issue with, as eating more produce is never a bad thing. However, don’t try to sell me on poor research that you don’t even cite and misleading propaganda to push your philosophy down my throat. At least provide some facts, that is all I ask. A CP client whom I used to train sent me an email the other day that I thought was worth sharing with you guys as it is rather enlightening. I thought this would interest you. I was talking to a patient today and spreading the good word about pasture raised chicken and how by eating it, makes the person that much more awesome. She had told me that she was allergic to penicillin and a bunch of other things. For about 2 years, whenever she would eat “chicken,” she would get sick. For awhile, she thought it was just a bad piece of chicken and didn’t think anything of it. She finally went to to doctors and had tests among tests done to try and figure out what was wrong. Finally, they figured out that the antibiotics in the “bad” chicken, most likely the penicillin was causing her to become sick. She tried pasture raised chicken and hasn’t had a problem eating that at all. Thought you would like to hear about that. That is pretty gross if you ask me. Food is about more than just the macronutrients and calories it provides, no matter how many experts try to tell you otherwise. A chicken force-fed on a factory “farm” in an enclosed barn who never sees daylight while being smashed in with 10,000 other chickens and given antibiotics to prevent its crappy diet and unsanitary living conditions from killing it, is not the same as a chicken allowed to roam freely outside, eat grubs, maggots, insects or whatever it feels like and only medicated if necessary (just like humans should be). While the breast from each “might” provide the same amount of protein, fat and calories, they are not equal. It is important to realize that the second chicken is going to have a significantly better fatty acid profile, with more omega-3′s and less omega-6′s. It also does not come with its own dose of penicillin! Finally, it tastes better and more than likely contains higher amounts of some yet unidentified element that is better for our health. The longer we study food and nutrition, the more nutrients and elements we discover that have benefits to our health. More often than not, these elements are maximized when the food is raised properly, and not in some horrible mass production designed to maximize the company’s profit margin. Eggs are a perfect example. Eggs from chickens raised in the healthy manner I described have been found to have 4-6x more vitamin D, 2x more vitamin A, 4x more vitamin E, 8x more beta carotene, and 3x more omega-3 fats! I can only imagine how much more choline, lutein, zeaxanthin and other beneficial compounds pastured eggs have over their conventional brethren! It stands to reason if these well-raised chickens are putting out much healthier eggs, they themselves will be much healthier animals. Which would you rather eat: a strong and healthy chicken that produces nutrient-rich eggs, or a weak and sickly one that requires antibiotics to keep it alive and produces nutrient-depleted eggs? The choice is yours. Yesterday was my first Father’s Day, and it was absolutely wonderful. The weather was just perfect, and even though my team lost in our family softball game, I did hit two homeruns! My wonderful wife bought me Strong Fathers, Strong Daughters, a book that a reader suggested a while ago. I am looking forward to reading that for sure. One night last week, I can’t remember which, my wife and I watched the Best Picture winner The King’s Speech, and I must say I thoroughly enjoyed it. Colin Firth most certainly deserved the Oscar, as he was abolutely tremendous. The back and forth dialogue between he and Geoffrey Rush was fantastic, and personally, I think Rush was every bit as good as Firth. In many ways he made the movie. While many might think this is a stuffy period piece, it was actually quite funny as I found myself laughing out load repeatedly throughout the movie. While some contend that some of the historical elements of this movie were not perfectly accurate, I do have to point out that it is not a documentary, it is a movie. Complete historical accuracy is not required. Overall I found the direction to be excellent, the feel of the period to be spot on and the acting to be absolutely superb. This was a highly enjoyable and uplifting movie and definitely deserves to be seen. As a lifelong hockey and Bruins fan, and someone who played the game for 15 years, it was quite a moment last night watching the Bruins hoist the Stanley Cup for the first time in 39 years. They made it to the Finals in 1988 and 1990, but I was only 3 and 5 years old (my birthday is a month after) so I hardly remember watching them get demolished by the juggernaut that was the Edmonton Oilers back then. Tim Thomas played absolutely out of his mind, allowing only 8 goals in 7 games and making tons of spectacular saves. Even the old man Mark Recchi played some phenomenal hockey. At the beginning of the series I was telling my dad how ridiculous it was that the 43 year old was on the power play and getting so much playing time, and then he comes through with 3 goals and 4 assists in 7 games, providing steady play and big goals. Now he gets to ride off into the sunset and then into the Hall of Fame. Not a bad way to end your career. The greatest part is this team is comprised mostly of guys in their prime, or even a little younger! Thomas and Zdeno Chara, their best defenseman, are in their 30’s, but other than that their key players are all young. Lucic, Horton, Bergeron, Krejci, and Marchand are all 26 or younger! Tyler Seguin, the 2nd overall pick last year is only 19. They also have the 10th pick this year. Their backup goalie is excellent and only 23. They are locked and loaded to be competitive for the next several years. I am looking forward to every minute of it. Up here in New England we have been spoiled over the past 10 years. The Patriots have 3 world championships, the Red Sox 2, the Celtics 1 and now the Bruins with 1. In many ways I savor this one the most, as hockey was my first love as a kid and for as long as I can remember the Bruins have been the red headed step child of the 4 major pro teams. Boston used to be a hockey town, and it is great to see the Bruins thrusting themselves back into the spotlight. They can now be uttered in the same sentence as the other 3 teams with this monumental achievement. I tip my cap to them and look forward to next year! This was a comment on my recent blog post on sprouted grains that I thought needed to be shared with everyone as I feel it is an area wrought with confusion. Q. Brian, I asked this in one of your previous blog posts but never got a response. These breads all have gluten added to them as an additional ingredient. I understand that sprouting grains reduces their phytic acid content, but it seems to me like gluten is a much bigger problem that phytic acid. Especially since sprouting only reduces not completely eliminates phytic acid. Moreover, in the genesis brand, with the added sunflower, pumpkin, sesame, etc. seeds, wont there be a higher omega 6 content. Seems to me you be better off going with something like corn tortillas. Food for life makes a sprouted corn tortilla that has no gluten. You haven’t mentioned their corn tortillas at all yet, but this would be the best option in my opinion. Would love to hear your thoughts. A.Yes gluten is added as an ingredient to those breads, but it is done to help hold them together. Ever try to eat those products without toasting them? They tend to fall apart easily because many of the starches making them up are gluten-free (legumes, lentils, millett, corn, quinoa, etc). Gluten is a very sticky protein, and is the glue that holds bread together. Wheat has the highest gluten content, hence why it is so popular for bread. 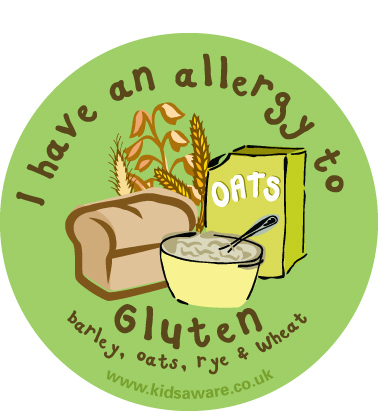 While gluten is added to them, overall they seem to have less gluten as they are clearly not as strong. I have written rather extensively about sprouted grains and why they are significantly better than traditional whole grain bread. I have generally pointed people in the direction of Ezekiel products. While these products are fantastic, they are not the only sprouted grain products available. In fact there are two other sprouted grain lines made by Food for Life, the company that makes the Ezekiel products. The first line is the 7 Sprouted Grains line. It contains sprouted wheat, rye, barley, oats, millet, corn, and brown rice. Since it does not contain any legumes or lentils like the Ezekiel line does, it is much more similar to “regular” whole wheat bread in terms of taste and consistency and will probably be an easier transition to sprouted grains than the Ezekiel line. The only downside is the line is smaller. It contains bread and english muffins. A second line is the Genesis line of sprouted grains and seeds. This products contains 19 grains and seeds, including sprouted wheat, spelt, corn, barley, quinoa and more as well as organic pumpkin, sesame, sunflower, sprouted chia and sprouted flax seeds. While I have never personally tried this line, I generally like breads with seeds and bits of grain in them. I like the nutty taste and texture. This also contains only bread and english muffins. There are other companies besides food for life. Alvarado St. Bakery also makes a lot of sprouted grain products. They make a lot of different breads, wraps, hamburger and hot dog buns and more. 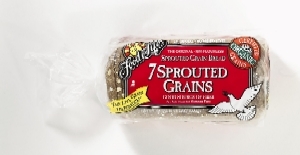 The point is there are many other great sprouted grain options besides just Ezekiel products. While they are fantastic, they are not alone. Feel free to try them all! While at the hospital yesterday for my dietetic internship, I came across a brand of chips I had never seen before. While I can’t say I have been overly impressed with the food choices in the cafeteria, I do have to admit that these surprised me. They were by a company called Food Should Taste Good, which is a pretty sweet name. Surprisingly, their chips were made from real ingredients, from a quality oil and contained plenty of fiber. 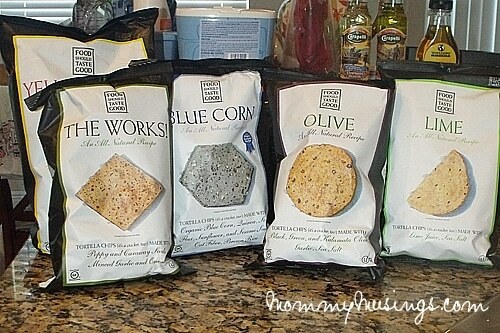 They have many different products, ranging from blue corn, to sweet potato, to the works. Rather than the usual soybean or safflower oil, which are loaded with omega-6 polyunsaturated fatty acids, they instead use a high-oleic sunflower or safflower oil. What this means is chose sunflower or safflower oil from plants that have been bred the old-fashioned to way to have a very high oleic acid content, the healthy monounsaturated fatty acid in olive oil, and a low polyunsaturated fatty acid content. This is a great thing. The simplicity and quality of the ingredients definitely impressed me, especially for a chip. They were quite tasty too! While I would not recommend eating chips every day, here and there, especially in the summer, they are nice to throw in with a grass-fed burger. They are a perfect summer food, so check them out! I am a big proponent of using less plastic in your daily lives. Plastics contain a ton of problematic chemicals that function as endocrine disruptors, estrogen mimetics, potential carcinogens and who knows what else. Some of these chemicals, like BPA and phthalates, are now being used less and less, with BPA being banned in some states (including Maine). Even with these dangerous chemicals removed, who knows what else is possibly lurking in these products that just have not been discovered yet? Maybe none, maybe a ton, no one knows. To avoid the whole situation, especially if you already have hormonal issues, I highly recommend you replace things like plastic waterbottles, coffee mugs, tupperware and more with glass and stainless steel options. While more expensive, they are well worth it in my opinion (especially with a newborn). Now whenever I tell people to replace their plastic items, they always ask what products should they replace them with? Well I will outline the products I like and use, and maybe help explain which ones might better suit your needs. We have two different types. 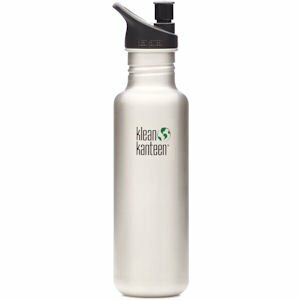 We have Klean Kanteens with sport caps, which are awesome when you are moving or exercising as they don’t spill when you drink them. The only downside to the Klean Kanteens I have is they have a narrow mouth which makes it tough to fit in ice cubes or protein powder. The bottles come in multiple sizes, and I like the 27oz and the 40oz options. They do now make a wide mouth option, which you can get up to a 64oz bottle. However I have never used these so I can’t comment, but they are probably great. 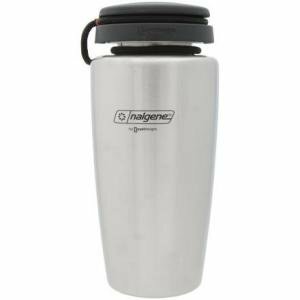 The other style I really like is by Nalgene, as it is a wide-mouth top, and the bottom bevels down to fit into cup holders. It comes in 32 and 38oz options. This one easily takes ice cubes and protein powder, and is also a little easier to clean. The only downside is the lack of a sport cap option. Otherwise, they are great. I am a big fan of the OXO Good Grips LiquiSeal Travel Mug. The body is all stainless steel and it is completely leak-proof. It will keep your coffee hot for hours! It also fits nicely into cupholders and is aesthetically pleasing. Anna and I each have one for coffee or tea, and we both love them. Now this is a big one. People will keep their tupperware for years, despite the fact that microwaving your food in plastic is most definitely not a good idea, as it will leach out a lot of unwanted chemicals from the plastic. I am not really a fan of the microwave in general, but that is another topic for another day. Even beyond just microwaving, having fats sit in plastic will also leach out more unwanted chemicals from that plastic tupperware. This is a problem, but an easy one to fix. I love the glass Pyrex No Leak Lids. They are completely leak-proof, the lids are BPA-free, and the containers are freezer, microwave, and dishwasher (top rack) safe. Plus they have a little vent in the lid so you can keep it on if you do put it in the microwave, or when storing them you can keep it open so they don’t get that musty smell if there was any water left in them. Seriously, they are awesome. I recommend the 8 piece set, which comes with a 7-cup bowl, two 4-cup bowls and a 2-cup bowl. Depending on your needs, I would get 2-3 sets of them, and you will be set for years. The water bottle, coffee mug and tupperware are the big 3 in removing plastic from your life, but there are certainly other areas where it can sneak in. Beware the many canned items have BPA in their can lining, so look into higher quality products. For example, tuna is a big offender, so try Wild Planet tuna. Their cans are BPA free. Another item is a tea kettle, I like the Breville Ikon Stainless Steel Kettle. If anyone has any other items they like, or other ways to get plastic out of their lives, please chime in! So this is the end of my last week home with Anna and Kate before my Dietetic Internship begins full-time on Monday, which is a little bittersweet. I am excited to start my internship, but I am saddened to be seeing far less of my wife and baby girl! While I love her to pieces, I do hope the sleep schedule improves soon! Anyway there are several other points I want to make today, which are a little bit more nutrition and fitness related. 1. A theme I see quite often with online consulting clients is allowing meetings or other free food opportunities to dictate their food choices. While I understand this can be a nice money-saver, which I am all for, it is important to ensure that the choices you make in these situations are solid. You might be able to get a quality sandwich or other entree, but often the sides are poor. At the very least you can consume a quality entree and bring your own sides, such as some fruit or veggies and hummus. 2. 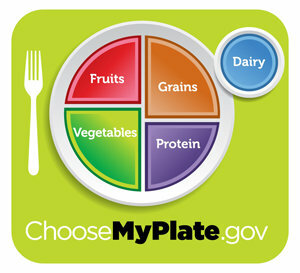 What are everyone’s thoughts on the ditching of the Food Pyramid in favor of the new MyPlate? I think it is definitely MUCH easier for people to understand and apply to their own eating, however it still does not address the issue of the actual choices people make to make up their plate, which is often the real problem. As I excitedly pointed out last week, I was in Men’s Health for the first time. While the articles can be a little hit or miss for me, overall it is far and away the best mainstream source of fitness information out there. They have great guys like Bill Hartman, Mike Robertson and more writing for them, which certainly helps their cause. However, the best part of the magazine for me are the research bulletins in the beginning. They discuss really cool new findings that I love reading about. While I am sure plenty of you read the magazine, for those that don’t I wanted to outline a few of those new findings, as I thought they were really interesting.